Free 2014 Latest Cisco 200-120 Dump (81-90) Download! Free 2014 Latest Cisco 200-120 Dump (71-80) Download! Free 2014 Latest Cisco 200-120 Dump (61-70) Download! Free 2014 Latest Cisco 200-120 Dump (51-60) Download! Different VLANs can’t communicate with each other , they can communicate with the help of Layer3 router. 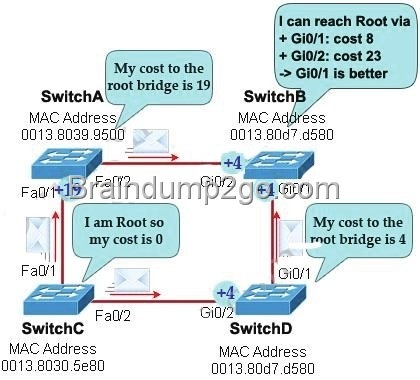 Hence , it is needed to connect a router to a switch , then make the sub-interface on the router to connect to the switch, establishing Trunking links to achieve communications of devices which belong to different VLANs. When using VLANs in networks that have multiple interconnected switches, you need to use VLAN trunking between the switches. With VLAN trunking, the switches tag each frame sent between switches so that the receiving switch knows to what VLAN the frame belongs. End user devices connect to switch ports that provide simple connectivity to a single VLAN each. The attached devices are unaware of any VLAN structure. For example, from the last graph (last 72 hours) we learn that the highest CPU utilization within 72 hours is 37% about six hours ago. A. Send periodic updates regardless of topology changes. B. Send entire routing table to all routers in the routing domain. C. Use the shortest-path algorithm to the determine best path. D. Update the routing table based on updates from their neighbors. E. Maintain the topology of the entire network in its database. Distance means how far and Vector means in which direction. Distance Vector routing protocols pass periodic copies of routing table to neighbor routers and accumulate distance vectors. In distance vector routing protocols, routers discover the best path to destination from each neighbor. The routing updates proceed step by step from router to router. By default the administrative distance of a static route is 1, meaning it will be preferred over all dynamic routing protocols. If you want to have the dynamic routing protocol used and have the static route be used only as a backup, you need to increase the AD of the static route so that it is higher than the dynamic routing protocol. Free 2014 Latest Cisco 200-120 Dump (41-50) Download! How is an EUI-64 format interface ID created from a 48-bit MAC address? An IPv6 address is represented as eight groups of four hexadecimal digits, each group representing 16 bits (two octets). The groups are separated by colons (:). An example of an IPv6 address is 2001:0db8:85a3:0000:0000:8a2e:0370:7334. The leading 0’s in a group can be collapsed using ::, but this can only be done once in an IP address. address. Anycast is designed to send a packet to the nearest interface that is apart of that anycast group. The sender creates a packet and forwards the packet to the anycast address as the destination address which goes to the nearest router. The nearest router or interface is found by using the metric of a routing protocol currently running on the network. However in a LAN setting the nearest interface is found depending on the order the neighbors were learned. The anycast packet in a LAN setting forwards the packet to the neighbor it learned about first. 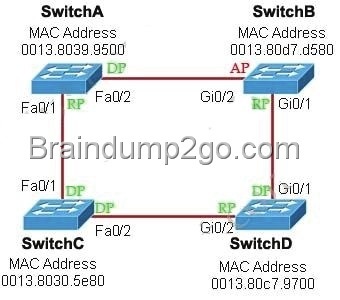 Subnetting is used to break the network into smaller more efficient subnets to prevent excessive rates of Ethernet packet collision in a large network. Such subnets can be arranged hierarchically, with the organization’s network address space (see also Autonomous System) partitioned into a tree-like structure. Routers are used to manage traffic and constitute borders between subnets. A routing prefix is the sequence of leading bits of an IP address that precede the portion of the address used as host identifier. In IPv4 networks, the routing prefix is often expressed as a “subnet mask”, which is a bit mask covering the number of bits used in the prefix. An IPv4 subnet mask is frequently expressed in quad-dotted decimal representation, e.g., 255.255.255.0 is the subnet mask for the 192.168.1.0 network with a 24-bit routing prefix (192.168.1.0/24). Which command can you use to manually assign a static IPv6 address to a router interface? To assign an IPv6 address to an interface, use the “ipv6 address” command and specify the IP address you wish to use. In the Internet Protocol Version 6 (IPv6), the address block fe80::/10 has been reserved for link- local unicast addressing. The actual link local addresses are assigned with the prefix fe80::/64. They may be assigned by automatic (stateless) or stateful (e.g. manual) mechanisms. The network administrator is asked to configure 113 point-to-point links. Which IP addressing scheme defines the address range and subnet mask that meet the requirement and waste the fewest subnet and host addresses? We need 113 point-to-point links which equal to 113 sub-networks < 128 so we need to borrow 7 bits (because 2^7 = 128). The network used for point-to-point connection should be /30. So our initial network should be 30 ?7 = 23. So 10.10.0.0/23 is the correct answer. to read startup-config in NVRAM / or 0x2142 to start in “setup-mode”) – check the startup-config file in NVRAM for boot-system commands – load IOS from Flash. Free 2014 Latest Cisco 200-120 Dump (31-40) Download! Several methods are used terms of migration including tunneling, translators, and dual stack. Tunnels are used to carry one protocol inside another, while translators simply translate IPv6 packets into IPv4 packets. Dual stack uses a combination of both native IPv4 and IPv6. With dual stack, devices are able to run IPv4 and IPv6 together and if IPv6 communication is possible that is the preferred protocol. Hosts can simultaneously reach IPv4 and IPv6 content. Free 2014 Latest Cisco 200-120 Dump (21-30) Download! Free 2014 Latest Cisco 200-120 Dump (11-20) Download! Free 2014 Latest Cisco 200-120 Dump (1-10) Download!